Does a small assignment feel like an unending task or do you feel like "taking a break" and doing nothing for a while? That's what stress can do to you. 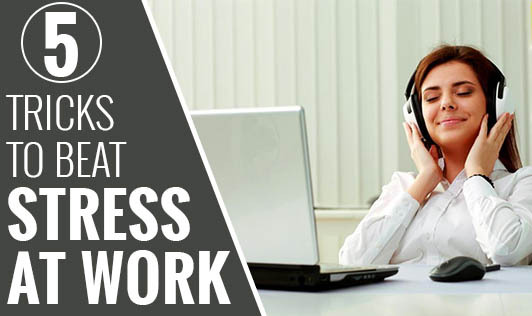 Here are 5 quick fixes to take control of your stress at work. Ditch the coffee: Many of us drink coffee at work to take a break or to wake up from a sleepy afternoon. As we all know, Coffee contains caffeine, a stimulant that may keep your eyes wide open, but at the same time it suppresses the activity of adenosine, a component that relaxes the mind. Pay attention: Pay attention to how you feel, understanding your own cues of being stressed. Researchers say that a significant amount of stress is reduced in individuals who slow down, pay attention to their racing heart beat, tightened muscles or breathing pattern, which are all classic signs of being stressed. This helps them understand the cause of their stress and deal with it in the appropriate manner. Do the stretch:Physical therapists recommend a quick stretch to beat stress at work. Clasp your hands behind your neck, squeeze your shoulder blades together and let your head fall forward so your chin is close to your chest. Bring your elbows together in front of you so they're touching. Pull down with your hands for several seconds, then release. Repeat six to eight times whenever you feel stressed and see the difference. Get Organized: Many stress experts say that most reasons for stress at work is the lack of being organized. It is the most needed, but most lacking aspect to beat stress. Spending less than an hour to organize your daily activities gives you more time for yourself. Learning to prioritise,ogives you more time to spend with family, friends and to do things you like doing. This indefinitely reduces stress. Laugh! Laughing de-stresses you. Pick up a magazine and read a joke, look for jokes online, talk to a colleague about a funny experience or just simply joke with a friend and make it a light moment! Stress is a part of our lives. Some of us have too much of it, struggling to cope. It is important to understand that stress is normal and there are simple ways to deal with it. Deal with them the right way and you sure will feel better!